In an English folk scene currently bursting with bold and innovative music, Lady Maisery shine brightly. In 2016 The Guardian described theirs as “some of the most exquisite, thrilling vocal harmony work in the English folk scene”. With their unique approach to harmony singing, intelligent and thoughtful arrangements of both traditional repertoire and original compositions, multi-instrumentalists and singers Hazel Askew, Hannah James and Rowan Rheingans harness and celebrate their united voice. 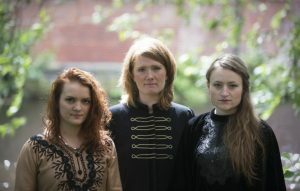 Whether unearthing a feminist twist hidden in a traditional tale, delivering a poignant anti-war ballad, or showcasing their immense multi-instrumental talents in original compositions that draw on a myriad of musical influences, Lady Maisery are skilful explorers of the power, beauty and vitality of song. Over the last five years, the trio have toured widely, performing sell-out shows across the UK and Europe and have released three critically acclaimed albums. Underpinning every performance are Lady Maisery’s distinctive harmonies: sometimes lush and rich, sometimes dark and invigorating, they intertwine with assured precision. The trio are also one of the foremost English proponents of mouth music, or “diddling” – once common in England, and still found across parts of southern and northern Europe, this form of singing without words is a perfect showcase for their sheer musicality. Each also an accomplished instrumentalist, many songs are expertly accompanied by a rich tapestry of Rowan’s fiddle, banjo and bansitar, Hazel’s harp and concertina and Hannah’s accordion and foot percussion.